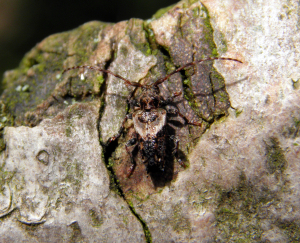 Observation - Lesser Thorn-tipped Longhorn Beetle - The Hollies, Shropshire - UK and Ireland. Description: Last weekend I had the pleasure of visiting The Hollies, a Wildlife Trust reserve and SSSI in Shropshire. Part of the Stiperstones area, the reserve is named after its amazing ancient Holly trees, some thought to be around 400 years old. See: http://www. There was lots of evidence of beetle activity in the form of small holes in the Holly wood, but the only beetle I actually saw on a very cold day was this longhorn. It's one of my favourites, with spectacular ornaments on its back, and has larvae that develop in the dead twigs of Holly and other trees.